At the steep banks of the Savara torrent gorge , formed by the ancient glaciers and impetuous waters of the torrent, the Gran Paradiso Company of Alpine Guides have created in collaboration with the Valsavarenche community an actual and appropriate Adventure Park in the canyon, which with its particularly technical characteristics is indeed unique in Italy. The course will be done in absolute safety thanks to the indispensible help of the Alpine Guides, who accompany groups of 4-8 persons in all athletic and natural adventures, which will take about 2-3 hours. 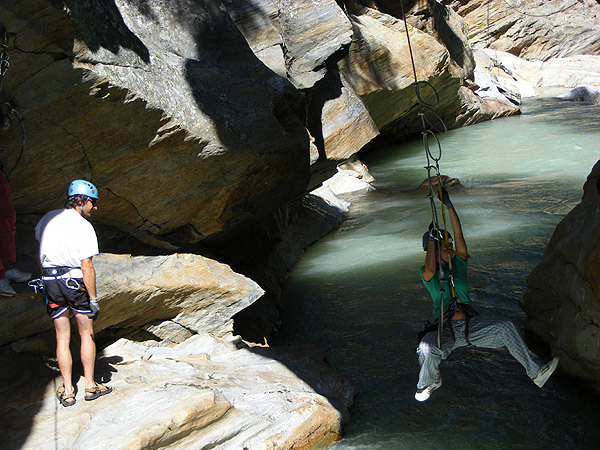 This is an experience, which unites the mavels of two different worlds, canyoning and climbing, and combined they form something truly extraordinary, an unique Adventure Park. With the alpine equipment provided to the participants by the Alpine Guides, you move attached over the Savara torrent, in correlation of the narrows and wonderful rapids, which are formed close to the village Terré, and immerge entirely in one of the most spectacular sceneries of the Gran Paradiso National Park. In this truly unique place it is possible to listen to the drone, impressive and compelling. It comes from the water of the torrent, which flows from the glaciers carrying away all fears and leaving a sensation of inner calm and harmony with nature.